We just wanted to take a moment to thank everyone for coming out to our shows this last weekend. We had an amazing time with all of you and are truly overwhelmed by how amazing all of you are. We know we say it all the time, but you are really the reason we still do this, and we are humbled by how many people care about Tsunami Bomb as much as we do. We would like to make sure to thank the amazing bands we were able to play with on this run, and we HIGHLY recommend you all check them out if you missed them this weekend. The Von Tramps, Western Settings, Off The Mark, First Or Last, The Venomous Pinks, Intoxicated Rejects, and War Called Home. Some of you we were able to spend some time with, some of you we weren’t, but we were all blown away by how incredibly talented you all were. Thank you for playing with us. 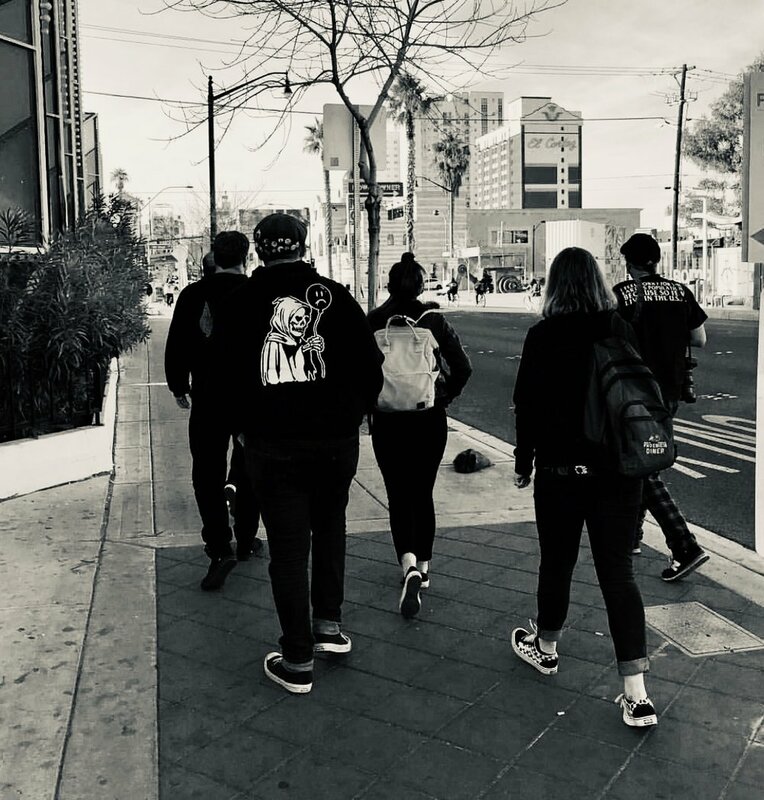 We want to thank the Toxic Toast Theater (and Toxic Toast Records) in Long Beach, the Yucca Taproom in Tempe, and The Bunkhouse Saloon in Las Vegas. All of the venues were amazing, and need your continued support. Tell more bands about them, and get your friends out there to check them out. Especially in the case of the all ages Toxic Toast Theater in Long Beach, CA. No bar means anyone who walks in the door is a huge help in keeping it open, and so many all ages venues are gone now. A special thank you to TJ from Suckerpunch Concerts in Las Vegas, whom we have realized has been helping bring us to Las Vegas since 2000. That’s 19 years! Crazy! A very special thank you to Kat (and Ron) from Crawlspace Booking who put the run together. Charlie Price from the incredible band Steadfast (from Houston, TX! They have a new album coming soon!) for all his work as our Tour Manager (and pulling double duty at merch too). Honestly, we don’t know what we would do with out you. Amber Mannon of Mannon Pictures for making time to do a photoshoot with us (what we have seen looks incredible!). An as you may have noticed from our social media feeds, for the first time we had Daniel Dreifuss, a photojournalist who joined us on this run. He got a bit more access to the world of this band and took some incredible photos, and we were blown away by what we’ve seen. You were a lot of fun to have along Daniel! We hope we can have you with us again! We also want to shout out to Roxy and Chris of Crimson Riot! who put us up in Las Vegas. You guys are the best! Finally, though it may seem weird, we want to thank some of the members of the band who have to move heaven and earth to get out on these runs. Tsunami Bomb is a labor of love for us. We love our band. There are members who travel great distances, sleeping in airports, or flying all night only to jump back into their own lives once they get home like nothing insane took place over the weekend, and we just want you guys to know your bandmates love you even more for it. All right, no more mushy post. 2019 is a big year for Tsunami Bomb, we have a LOT of news coming that you guys are going to be happy about! We can’t wait for the Northwest dates late next month. Check our TOURS page or our social media for details. We know we didn’t make it to Portland, OR this time. We are so bummed, but please think about making the trip to the Tacoma, WA show on March 2nd with Death By Stereo. All the shows will be great, but that one is going to be insane and it’s the closest one to you!